Most of it is already re-released, and available, in single or double CDs. The remaining few (like for example Wahnfried: Trance 4 Motion), are probably coming soon. Thanks for the info. 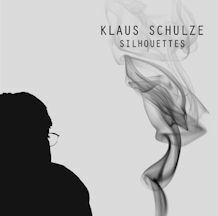 Interesting to see that the Silhouettes album was first announced (maybe unofficially) in 2015. Then it was withdrawn, and we did not hear more about it until now. It is stated that the 2015 album was recorded then, and there are three track titles provided. Now we know that the new album is recorded summer/autumn 2017, and has four tracks. I wonder why he kept the album title from the planned 2015 album, but recorded new music for it. Makes me wonder if there actually is another unreleased album from 2015. Will be exciting to see and hear the new album. I also wonder if the cover that was provided for the planned 2015 release is still valid, or if there will be a new cover. Anyway, I am really eager to hear this new album. From the description it sounds very good to me. Is that the smoke from his cigarette on the cover? So, he used the cover from three years back then (with small modifications). Makes me wonder if the music is also mostly what was composed back then. Information from kdm says it was recorded last summer, but as information from him is not always too trustworthy (in my opinion) we can not be sure.